Jane Goodall, who has been called "the Einstein of behavioral sciences" by the Los Angeles Times and "a heroine, in a hero-less time" by the Christian Science Monitor, will deliver a Timothy and Sharon Ubben Lecture at DePauw University on Wednesday, April 17, 2013. The world-renowned conservationist, United Nations Messenger of Peace and founder of the Jane Goodall Institute will discuss "Sowing the Seeds of Hope" in an 8 p.m. address in Neal Fieldhouse, which is located within DePauw's Lilly Physical Education and Recreation Center (702 S. College Avenue). Like all Ubben Lectures, the event is presented free of admission charge and is free and open to all. In the summer of 1960, 26-year-old Jane Goodall arrived on the shore of Lake Tanganyika in East Africa to study the area's chimpanzee population. Although it was unheard of for a woman to venture into the wilds of the African forest, the trip meant the fulfillment of Goodall's childhood dream. As she first surveyed the mountains and valley forests of the Gombe Stream Chimpanzee Reserve, Goodall had no idea her coming efforts would redefine the relationship between humans and animals or that this project would continue into the 21st century. One of Dr. Goodall's most significant discoveries came in her first year at Gombe, when she saw chimps stripping leaves off stems to make the stems useful for fishing termites out of nearby mounds. This and subsequent observations of Gombe chimps making and using tools would force science to rethink the definition that separated man from other animals: "man the toolmaker." 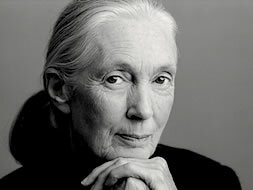 Dr. Goodall also observed chimps hunting and eating bushpigs and other animals, disproving the widely held belief that chimpanzees were primarily vegetarians. Goodall defied scientific convention by giving the chimpanzees names instead of numbers, and insisted on the validity of her observations that the chimps had distinct personalities, minds and emotions. 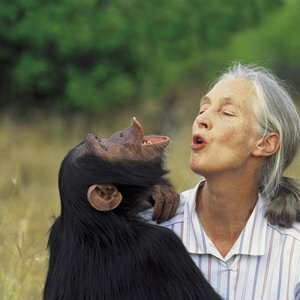 She wrote of lasting chimpanzee family bonds. Through the years her work yielded surprising insights such as the discovery that chimpanzees engage in warfare. Dr. Goodall established the Gombe Stream Research Center in 1964. Under the stewardship of Tanzanian field staff and other researchers, it continues Goodall's work today, making it one of the longest uninterrupted wildlife studies in existence. In 1977, she founded the Jane Goodall Institute for Wildlife Research, Education and Conservation to provide ongoing support for field research on wild chimpanzees. Today, the mission of the Jane Goodall Institute is to advance the power of individuals to take informed and compassionate action to improve the environment for all living things. The Institute is a leader in the effort to protect chimpanzees and their habitats and is widely recognized for establishing innovative community-centered conservation and development programs in Africa and the Roots & Shoots education program in nearly 100 countries. 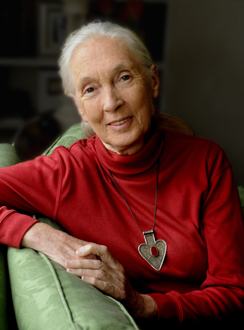 In January 2006, Dr. Goodall, DBE, was honored as an Officer of the French Legion of Honor for her work with primates and her extraordinary efforts to encourage positive action around the world as well as the conservation, development and education programs of the Jane Goodall Institute. The Légion d'Honneur, established by Napoleon Bonaparte in 1802, is France’s most prestigious honor. Past award recipients include oceanographer and environmentalist Jacques Cousteau, anti-Holocaust and human rights activist Elie Wiesel, and deaf and blind activist Helen Keller. Dr. Goodall's scores of honors include the Medal of Tanzania, the National Geographic Society's Hubbard Medal, Japan's prestigious Kyoto Prize, the Prince of Asturias Award for Technical and Scientific Research 2003, the Benjamin Franklin Medal in Life Science, and the Gandhi/King Award for Nonviolence. 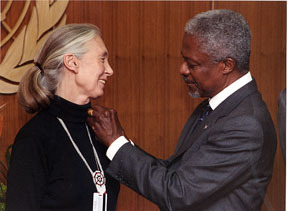 In April 2002 Secretary-General Annan named Dr. Goodall a United Nations "Messenger of Peace." Messengers help mobilize the public to become involved in work that makes the world a better place. They serve as advocates in a variety of areas: poverty eradication, human rights, peace and conflict resolution, HIV/AIDS, disarmament, community development and environmentalism. In 2003, Queen Elizabeth II named Dr. Goodall a Dame of the British Empire, the equivalent of a knighthood. 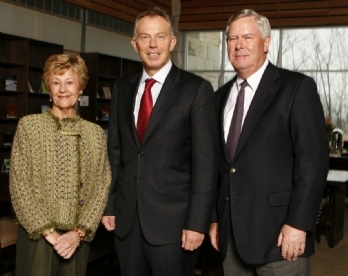 Goodall has received honorary doctorates from numerous universities, including: Utrecht University, Holland; Ludwig-Maximilians University, Munich; Stirling University, Scotland; Providence University, Taiwan; University of Guelph and Ryerson University in Canada; and a number of U.S. universities. 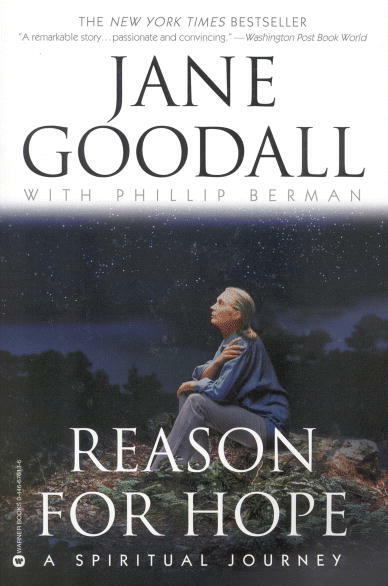 Dr. Goodall's list of publications is extensive, including two overviews of her work at Gombe -- In the Shadow of Man and Through a Window -- as well as two autobiographies in letters and a spiritual autobiography, Reason for Hope, along with Harvest for Hope: A Guide to Mindful Eating. Her many children's books include Grub: the Bush Baby, Chimpanzees I Love: Saving Their World and Ours and My Life with the Chimpanzees. The Chimpanzees of Gombe: Patterns of Behavior is recognized as the definitive work on chimpanzees and is the culmination of Jane Goodall's scientific career. Most recently, Dr. Goodall wrote Hope for Animals and Their World: How Endangered Species Are Being Rescued from the Brink. The cinematic biography Jane's Journey, which included appearances by Academy Award-winner Angelina Jolie and Pierce Brosnan, was released last year. 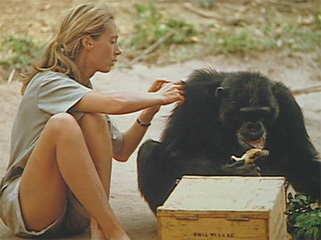 Goodall has also been the subject of numerous television documentaries and is featured in the 2002 film, Jane Goodall's Wild Chimpanzees. In her appearances around the world, Jane Goodall speaks about the threats facing chimpanzees, other environmental crises, and shares her message of hope for the future. She continually urges her audiences to recognize their personal responsibility and ability to effect change through consumer action, lifestyle change and activism. She has stated, "What you do makes a difference, and you have to decide what kind of difference you want to make."